There’s a machine that can stop Odo from changing shape. That’s the part I keep coming back to. It’s far from the most important revelation in “The Die Is Cast,” but something about it sticks in my mind. Maybe it’s because of how much this whole two-episode arc (as well as the various hints about the Cardassian and Romulan build-up which we’ve been getting all season) is about rigidity; about how much we work to establish an image of ourselves, and once we’ve decided we’ve found the right one, how hard we work to freeze it in place, as though permanence could be made eternal by a simple act of will. Tain’s attempts to return to his former prominence, to destroy the Founders in one fell swoop and end the Dominion threat, speaks of his arrogance, his misguided confidence in himself, and his unwillingness to adapt to the potentialities of new threats. He’s trying to regain his former status, and position himself as the new leader of the Cardassian empire, and to do that requires a certain kind of inflexible thinking. It means ignoring how long he’s been in retirement, how much the universe has changed in his absence. It means believing the Founders are no different than any other enemy, and therefore can be dealt with accordingly. It means, in effect, finding a point and holding to it—in effect, doing willingly what Odo is forced into. The resultant effect is eerily similar. Then there’s Garak, trapped between what he used to be and what he couldn’t help becoming. Odo suffers more physical agony, but if this episode has a heart, it belongs to the tailor, as his initial enthusiasm for taking part in Tain’s grand plans slowly begins to fade. It’s easy at first, of course. For the first time in many years, Elim and Enabran are spending time together without immediately wanting each other dead. They share a drink (Romulan, and, as such, sub-standard), and cheerfully discuss the destruction ahead. Garak indulges in some revenge fantasies about all the enemies he’s going to eliminate once he gets back to Cardassia, and he and Tain laugh about old times. Then Tain starts in on the real work: he needs Garak to interrogate Odo. 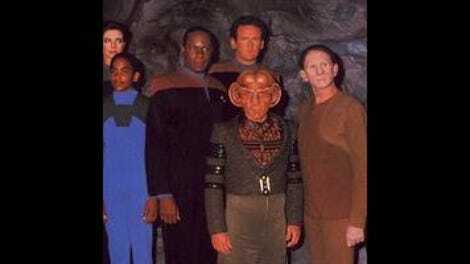 Because Odo is a Founder, and even if he claims he doesn’t know any of their plans, surely he must have some useful piece of information he can provide the cause. You get the impression that Tain doesn’t really care one or the other. He is, after all, the mind behind the Obsidian Order. If there was any relevant data to the cause at hand, surely he would have ferreted it out on his own. No, I’d bet the real reason Tain makes his request is to find out how far his old student is willing to go to prove his loyalty. Pretty far, it turns out. “The Die Is Cast” is an excellent episode across the board, and one of the reasons it works so well is that it doesn’t compromise Garak’s character in order to make him more palatable. 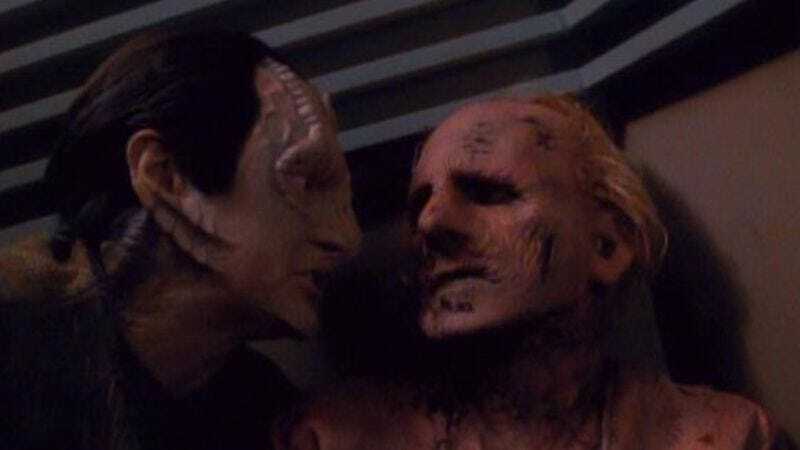 He is a gifted interrogator, and while the script makes it a point to describe his efforts as primarily psychological (Tain tells a story about Garak forcing a confession by simply staring at a prisoner for hours without speaking), there’s no question that he’s not above getting physical if need be. Or at least, that’s how he was in the old days. When Tain raises the issue, Garak willingly agrees to question Odo, and their first conversation has all the hallmarks of a villain trying to earn a hero’s confidence. Odo isn’t too worried; after all, he has no real fear of physical danger, and he uses the exchange mostly as a chance to mock Garak’s new allegiances. No one goes too far, and, apart from the shift in power dynamic, it’s a scene which probably could’ve taken place before the capture without too many changes. Basically, this is all within safe bounds, which is probably why Garak isn’t overly uncomfortable. His sleeves are still down, and his hands are still clean. Then Tain introduces the device which will prevent Odo from changing his form, and things get mean. Last week, we talked about how much of the power of Garak’s character lies in his fundamental ambiguity. Even though there’s an undeniable core to him, which means that his choices still have stakes, and that we care if he goes too far, there’s no comfortable reassurance that he’ll make the right choices, or that he’ll hold back when offered, say, a return to the prominence and power he once enjoyed. Just watch the look on Andrew Robinson’s face (and it always amazes me how much actors are able to convey through all those prosthetics) as Tain tells him there’s a way to truly hurt Odo. He’s clearly horrified at the idea, but even more tellingly, he’s horrified that he’s horrified. For most of his time on the show, Garak has talked a good game, and played the role of someone who choose to appear harmless, but probably isn’t; someone who, yes, is a nice guy right now, but that could change at any moment. Apart from his friendship with Bashir, Garak never really commits to anything. Even his tailor shop is expendable. But the drawback of getting what you most want is that you have to start making choices. You actually have to be someone, as opposed to collection of pleasant anecdotes and vaguely threatening innuendo. And now that the big moment has finally arrived, it turns out he might be the man (well, the Cardassian) he thought he was. Again, to the episode’s credit, it doesn’t shy away from the consequences. Garak tries a few lame attempts to avoid it, but in the end, he has to go back to Odo’s room, and use the device to torture the constable. And it’s horrifying. The makeup effects of Odo stuck in his human form are some of the most effective I’ve seen on the show; he’s pathetic and ghoulish, somehow, like he died in the middle of the conversation, but is so determined to make his point that he’ll keep talking until his jaw rots off. The camera stays focused on René Auberjonois for most of the scene, and he does remarkable work. Star Trek: The Next Generation took most of an episode to demonstrate the full effect of physical and psychological torture. DS9 does it in basically one scene, and while the result isn’t as quite as harrowing, it’s very, very effective. And of course, Odo does eventually break. Despite the constable’s repeated assurances that he knows nothing, Garak is convinced that Odo must have some secret in him, some piece of information he couldn’t bare to part with, and it turns out the tailor is right. Odo does have a secret: He wants to go home to his people. It’s a deeply personal revelation that Odo must’ve wanted to protect at all costs, and telling it must have hurt him. And it’s useless. It doesn’t change Tain’s mission, and it doesn’t provide any tactical advantage against the Founders. It just means that Garak wins for absolutely nothing. Leave him there for a second, face in his hands while Odo, finally given back his freedom, pours himself into a bucket. Sisko and the others keep themselves busy this episode, and while his decision to disobey orders and take the Defiant after Odo (and Garak) isn’t as exciting as the main story, it’s never a drag on the episode, and it does introduce some ideas which I’m betting will be important down the line. Namely that Commander Eddington, who’s done basically nothing since he was first introduced, is more a stickler for rules than anyone else in command on DS9, and his commitment to Starfleet leads him to sabotage the Defiant after the ship leaves the station. Eddington isn’t a big enough character for this to be a huge betrayal, and his presence in the first part of the episode (after being seemingly forgotten for so long) suggests he’s up to some kind of craziness, but it’s interesting that Sisko allows him to remain on the bridge after he confesses his actions. It shows the kind of strange gray area the show lives in now. Eddington may not have the right kind of loyalty, but they are all fighting on the same side. Odo makes a similar decision when he ultimately forgives Garak’s actions. Well, forgives may be going too far, but they don’t end the episode as enemies. Of course, before we get to that, we should probably look at the big ticket moment in “The Die Is Cast,” the twist which gives the hour its title (at least in the most obvious sense). The Cardassian and Romulan fleet arrives at the Founders’ home world. They read life signs on the planet below, and Tain, after savoring the moment for a second or so, gives the order to fire. The ships bombard the planet, destroying 30 percent of its crust, and—the life signs don’t change. It’s a trap. The Founders knew Tain was coming, and least than a minute after he realizes it, Jem’Hadar ships are popping into view—150 of them, to be exact. They make quick work of the Cardassian and Romulan fleet, which was, it turns out, the whole point of this trip. Tain thought he was in control, but as he realizes in the end (and his manic, despairing monologue as he desperately tries to figure out how it all went wrong, is yet another bit of awesome), the whole thing was designed by the Founders to wipe out the Cardassian and Romulan threat in one fell swoop. They had an inside man, it turns out: Lovok, the head of the Romulan forces, is a changeling. He makes a point of saying goodbye to Odo, and, given what we’ve learned about Odo’s true wishes, and what we’ve just seen of the Founder’s strategic genius, it’s amazing that Odo decides to go back to the station with Garak. This is all great stuff, thrilling and shocking, and, best of all, it has an impact which is going to affect how the show goes forward in ways I can’t predict. The end has the status quo restored, give or take a few thousand Cardassians and Romulans, but it’s still momentous; bad guys pulling reversals is nothing new, but this takes a background plot and casually, brutally upends it. It’s the kind of bold storytelling which makes for great drama. But as excited as I am to watch this play out, my favorite scene of the episode is the last one. Garak is sifting through the wreckage of his shop, and Odo pays him a visit. Throughout their entire conversation, Odo can only be seen in shadowy reflection, because he’s the one with the power now. Garak’s brief return to the old ways is over, blown to bits only hours after it began, but the truth is, it was over long before then. That’s why Odo invites him to breakfast, and why Garak, lost, stunned, and maybe hopeful, agrees. They both know each other’s secrets now; they both want to go home, but they can't. There is something which stops them from changing into who they want to be. It’s called a soul. I don’t know if Tain is gone for good or not, but if he is, that was one hell of an exit. Leland Orser, one of the great “That Guy”s, plays Lovok. And no, I definitely did not see that twist coming. “Oh, no, you’re going to torture me, aren’t you. How I’ve been dreading this. Please, have mercy, Garak.”—Odo, master of sarcasm. Admiral Toddman tells Sisko that the massacre of the Romulan and Cardassian ships was a bit like The Battle of Wolf 359, a.k.a. The One Where The Borg Killed Nearly Everyone. That’s not good. I have to apologize; this review is going to be shorter than it ought to be, as I spent too much time talking about the previous episode (which, to be fair, deserved the space), and now I fear I’ve used up my word quota. I say this because even though “Explorers” is a much quieter, and much less ambitious, hour of television than “The Die Is Cast,” it’s still quite good. I can’t help wondering if fans of the show gave this similar short shrift when it originally aired. Not because they were wrong (or shared my poor time-management skills), but because nothing of any real significance happens here. Bashir runs into a former rival from medical school, and realizes that he was getting worked up over nothing, and Jake and Sisko fly an ancient Bajoran ship to Cardassian space in order to prove a point. The events in the Gamma Quadrant aren’t mentioned, and don’t seem to have any affect on the proceedings. Sure, there’s some minor tension between Sisko and Gul Dukat, but there’s always minor tension between those two, and everything ends in (the non-lethal kind of) fireworks. If “The Die Is Cast” was a bold statement about how far the writers are willing to go with their main storyline, “Explorers” is a low-key reassurance that there’s still time for small, intimate character studies. But it still feels different somehow—probably because we have a greater sense of just how important the small, intimate moments really are. Plus, it’s been a while since the show gave Sisko some personal time, and while I wouldn’t think “immediately following a massive military maneuver out your back door” would be ideal vacation season, he probably needs all the relaxation he can get. It’s fun to learn a bit more about the commander; his character is clearly defined, but his interests aren’t as clear, for obvious reasons (we follow the majority of the characters on this show because of their day jobs; which doesn’t mean the show doesn’t have room for personal stuff, just it tends to be secondary). The idea that Sisko is so entranced by the history of Bajoran space travel that he’s willing to recreate an ancient Bajoran ship is a charming one. It’s a kind of geeky dad move that just happens to require significant resources, and end in a four day trip through the universe, and his excitement about the project, contrasted against the way almost no one else on the station understands the point of it, is cool. We’ve seen Sisko the badass before, and I’m sure we’ll see him again (he has, after all, finally grown that goatee you folks keep talking about), but I also like getting to know Sisko the dorky enthusiast. Plus, this leads to spending time with Jake, and the writers and actors on the show have always done a great job nailing the father/son dynamic. Jake’s been less of a presence on the series this season than he has in the past (at least, I think he has), but while he’s done the standard surly, and frustrated, teenager shtick before, it’s never become completely unbearable, and there’s always been a clear sense of the bond between him and Sisko. This episode is no exception. He initially passes on the trip (and I love how no one seems at all concerned about Sisko going off for a few days into deep space; it’s a sign of just how normal space travel has become in the future), but when he gets accepted into a writing school in New Zealand, he comes along for a chance to take over his ambitions with his dad. It all goes down fairly easily, and while there isn’t any real intense drama in the episode (Sisko’s ship has a few problems, and at one point even seems to have broken down completely with no way to call home for rescue, but it never feels all that urgent), it never gets boring. I especially liked Sisko’s reaction to Jake’s short story—the “shows promise” is something I’ve heard before myself, from my own dad, and I reacted to it about the same way Jake does. Back on the station, Bashir panics when he learns an old rival is dropping in, and, well, you can probably guess how this plays out. As much as I like the doctor, this whole storyline feels like something that belongs on a kid’s cartoon; the reveal that the rival actually wishes she’d gotten Bashir’s assignment on DS9 wraps things up a little too neatly, as though the whole thing were arranged just to teach Julian the value of appreciating what you have. It’s not incredibly tedious, but it does tip over into the kind of too-sweet easiness that Jake and Sisko’s story mostly manages to avoid. Curiously, this seems to happen often with Bashir storylines that don’t hinge on matters of life and death. Regardless, it’s not so bad as to ruin the rest of the episode, which, again, is good—although honestly, I’m not sure there’s really that much to say about it. Jake is worried his dad isn’t dating (does this ever come up again? No, don’t tell me, I’ll find out), Sisko is surprised about the New Zealand school offer, but then immediately urges Jake to take it. The usual back and forth between people who love each other but aren’t quite sure what happens next follows; Jake is getting ready to go out on his own, and Sisko recognizes that, and supports him, while at the same time feeling a loss. And then, at the end, when it seems all hope is lost, the Cardassians show up to tell them they’ve accomplished their goal, and all is well. Which, come to think, is basically the lesson of Bashir’s story: things are rarely as bad as you think. “The Die Is Cast” had roughly the exact opposite lesson, so maybe that’s the point of placing “Explorers” where it is. You need to have hope if you’re going to have fear, after all. Any episode with a drunken O’Brien and Bashir scene is fine by me.